When I met my friend L, she was a teacher and an administrator at an art school here in San Francisco. Over the years, she’s taught countless students skills that have helped them get jobs in video games companies, visual effects studios, and animation companies in the Bay Area and around the world. When they offered her a job in their training department, she was floored. L had moved to Portland about a year and a half after I had met her, though she sometimes came back to San Francisco to teach classes here on weekends. She still felt connected to the Bay Area, but she did technically live in another state. She had applied for the job kind of on a whim, and at each stage of the recruitment process she kept thinking she wouldn’t get the job anyway and that she was just going through the motions to keep herself sharp. But since they had now offered her this new opportunity, she now had a lot more to think about. While she really enjoyed her job and the people at the schools she was with, she realized that there wasn’t much room for growth – the highest up she could possibly go would be dean, and she didn’t want that job. I told her it was my opinion that she kind of needed to go for the position at Dreamworks. She had grown all she could at Ai, and now she needed to see what she was capable of at another company. After a lot of thought and agonizing over how her life might change (it was more complicated than just moving back), L decided she really had to go for the job. That was almost three years ago, and she still loves her job at Dreamworks. She’s still teaching people, which was one of the things she was most passionate about in her previous role, but now she gets appreciated even more for what she does (Dreamworks was rated one of the top 100 places to work for in 2012 by Fortune magazine). Along with the perks she gets there, she now also gets to have her name appear in movie credits! When she first started at Dreamworks, she brought us to a friends and family screening of “Megamind,” which came out shortly after she joined the team. While she hadn’t been working there long enough to get a credit on that movie, it was still great to see that the company had rented out a whole screen in a large movie theater so employees could bring people to see the film. 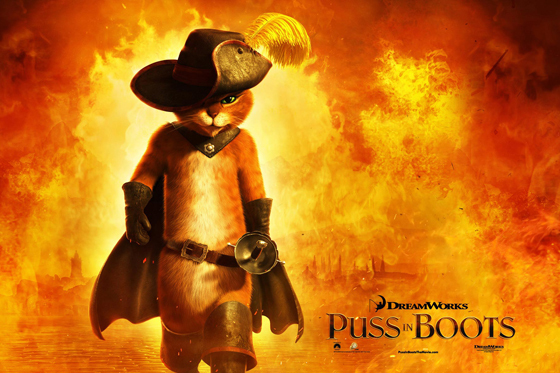 I couldn’t make it to the next two screenings, the most recent of which was “Puss in Boots” – the movie L felt that she had the most involvement in to date. We did however get the Blu-Ray from her (thanks, L AND Dreamworks!) and we FINALLY got to watch it this morning! Dreamworks always seems to have a knack for great humor in their films – kids enjoy the silliness, but plenty of the jokes are written for the benefit of grown-ups as well. This movie was no exception, and we were laughing almost the entire time. They also do a lot of photo-realistic work in their productions, and their films always have some visually fantastic elements in them. L is one of the people who helps make this possible, and I think it’s awesome that she now gets credits in these films. Congratulations, L! *Note: After watching Puss in Boots, we went back and checked the credits for “Kung Fu Panda 2,” which we found L had also gotten a credit on. We didn’t realize that since we didn’t see that one with her – we didn’t know to look and had missed her name when that movie came out! Congratulations for your work on TWO great movies, L! I’ve have to watch the movie now!